Sony: Vita the "iPod of Handheld Gaming"
PlayStation UK's Fergal Gara believes the Vita is well suited play "various roles" for diverse audiences. We won't mince words: the Vita is a fine piece of gaming hardware. Sure, it's a bit on the pricier end when you consider things like proprietary memory cards and its software library is perhaps not as wide and varied as other platforms, but it's nonetheless a great machine that tends to enthrall people who actually own it. That being said, with the launch of the PS4 the landscape on which the Vita stands is shifting, leaving many to wonder about the fate of the system and if it can be maintained as a viable portable gaming system. For Sony, however, there's no question that the Vita is here to stay, even as its position among its competitors changes. "I do actually think Vita has various roles it can play," said Fergal Gara, PlayStation UK's managing director. While he pointed to games like Killzone: Mercenary and Tearaway as evidence of the strength of its software, he also confessed that Sony had been eyeing the Vita as a companion piece for the PS4 for years. 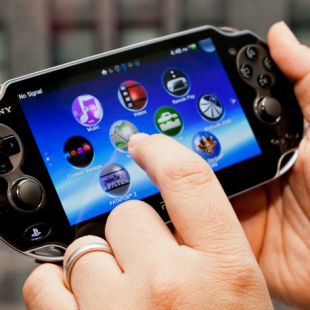 "[The] compatibility between the two was always designed into the Vita's system. By the time PS Vita development started we were well into the development path of the PlayStation 4, so things were very much designed to work together." Some might wonder why Sony even bothers continuing to push a portable like the Vita when its consoles are doing well. The answer can probably be rooted in the fact that Vita owners tend to buy a lot of software. "Compared to PS3, Vita has had a higher percentage of games bought digitally since it was first launched," said Gara. "It demonstrates how many people look at it as the iPod of handheld gaming." In other words, it's in Sony's best interest to sell more Vitas and with PS4 remote play, last year's price drop and PlayStation Now coming this summer, there arguably hasn't been a better time to snag one.